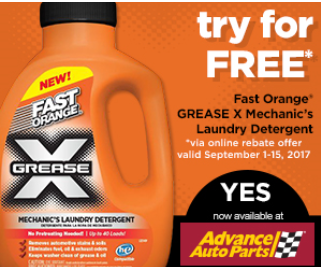 To get FREE Fast Orange Grease-X Laundry Detergent after Rebate purchase a qualifying Permatex Fast Orange Grease-X product to receive a rebate check for up to $14.99! The required purchase must be made at a Advanced Auto Parts stores between 10/01/2017 to 10/07/2017 . All redemption requests must be received or filed by October 15, 2017.